If you are a vegetarian, you know by now the lifestyle can be a bit of a challenge in a world where most people still consume meat. But to go vegetarian and low-carb? That sounds crazy-time-consuming and complicated, right? Yes, it can be a little tricky; however, living a meat-free and low-carb life is not out of the question. So what the heck can you eat with so many restrictions? We'll tell you. Author Margo DeMello certainly thinks so. After losing 45 pounds herself on a low-carb diet, DeMello wrote Low-Carb Vegetarian, a cookbook to help other vegetarians plan low-carb meals. "Tofu, seitan and a lot of the different fake meat products" make good staples, she suggests. "For the hot dog and hamburger products, though, you do have to look at the ingredients, because some do have a lot of carbs." And as for vegetables? 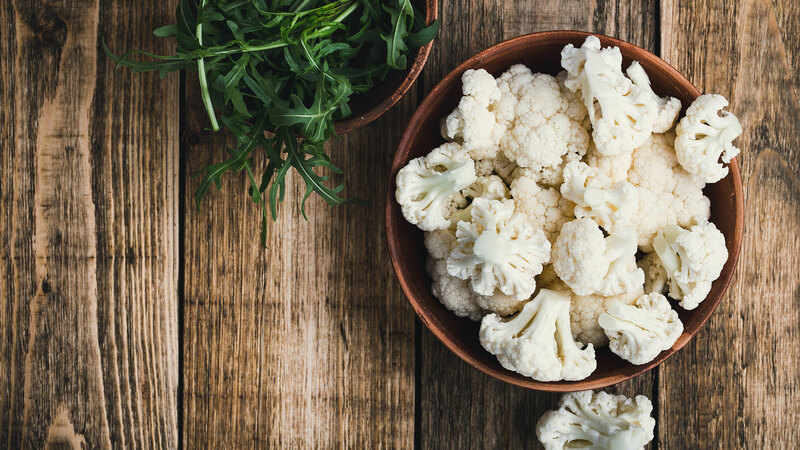 "Carrots are out, and potatoes are out," says DeMello, "but I include a ton of the different kinds of greens, and cauliflower is a good substitute for potatoes or rice." Anthony Leone agrees on the benefits of green leafy vegetables. Leone was the founder and owner of the now-closed New York City-based low-carb eatery Energy Kitchen. "The best vegetables that are low-carb are the ones that are low on the glycemic index, such as spinach, broccoli, romaine lettuce, cucumbers with the skin on, etc.," he says. "The vegetables you would want to stay away from are carrots, beets … and potatoes." Jason DeMoranville, author of The Core of a Balanced Diet, believes strongly in the benefits of soy. "As a staple food for vegetarians, you can't beat soy as the No. 1 vegetarian source for good digestible protein and low carbs every day," he says. DeMoranville isn't completely wrong about the benefits of soy, but we also know a growing number of people have been diagnosed with soy allergies over the past decade or so. So, what should low-carb vegetarians who are allergic to soy consume for protein? Believe it or not, there are other options. You can find protein in nuts and seeds (see the options on our shopping list below), nut milks (they aren't chock-full of protein, but they do help), and up-and-coming pea protein milks (like Ripple, which packs a pretty good punch). And there's always supplementation — Orgain makes a great plant-based protein powder that has 15 grams of total carbs per serving. But what about beans? Vegetarians commonly know beans as a great protein source, but most varieties of beans tend to be high in carbs. "Beans definitely have a place," says Les Harris, founder and executive chef of the Connecticut-based EZStrEATS. But because people tolerate different levels of carbohydrates in trying to lose weight, "the early stages of a low-carb diet plan may require the abstinence of beans for a limited amount of time." Chef Jacki Pearson of St. George, Utah-based Green Valley Spa agrees. "Beans also provide a healthy protein alternative in moderate portions of half a cup," she says. "Even though a half-cup serving of kidney beans has about 20 grams of carbohydrates, eaten in moderation of no more than one-half-cup serving of beans a day, the overall carbohydrate count can be kept down." A half-cup of kidney beans also contains about 7 grams of fiber. Fruits are often restricted in the beginning of many low-carb diets but are allowed in later phases. Consult your low-carb plan to see what fruits are allowed. "Eat foods rich in fiber, protein and healthy fats, such as nonhydrogenated, unprocessed coconut oil, olive oil, soybean oil and butter and no trans fats," suggests award winning certified chef and baker Karen Spirer. "Avoid the hydrogenated vegetable proteins found in margarine and processed salad dressings. Healthy fats cause virtually no blood sugar elevation, and protein causes very little." A version of this article was originally published in July 2014.